At Fantasy World, one of the best resorts in Kissimmee FL resorts, guests can enjoy spacious family vacation rentals that offer a variety of scheduled activities. While you rest from theme parks and shopping at the many outlet malls you can enjoy a number of entertaining and relaxing activities at Fantasy World! Enjoy Poolside Challenges and Crafting! Our Kissimmee family vacation rentals offer access to lazy rivers and more! Please note- activities change on a daily basis and may change without notice. The list below is a sample of some of the fun things we offer. Be sure to get a current schedule when you check in. Craft Cove – Select from a variety of crafts such as, sand art, wine glass etching, and tie-dye. Wacky Water Games – Noodle and relay races, underwater treasures hunts, water balloons. Poolside Challenge – Friendly competition where you compete at different activities. Trivia – Fun trivia questions with music, movies, sports and more for kids and adults. Scavenger Hunt – Follow answers and clues around the resort. Movie Nights- Family friendly movies in the activities center with popcorn.. Check out board games, ping pong paddles, tennis rackets, corn hole, shuffle board sets and for a fee DVD’s and pool table equipment. 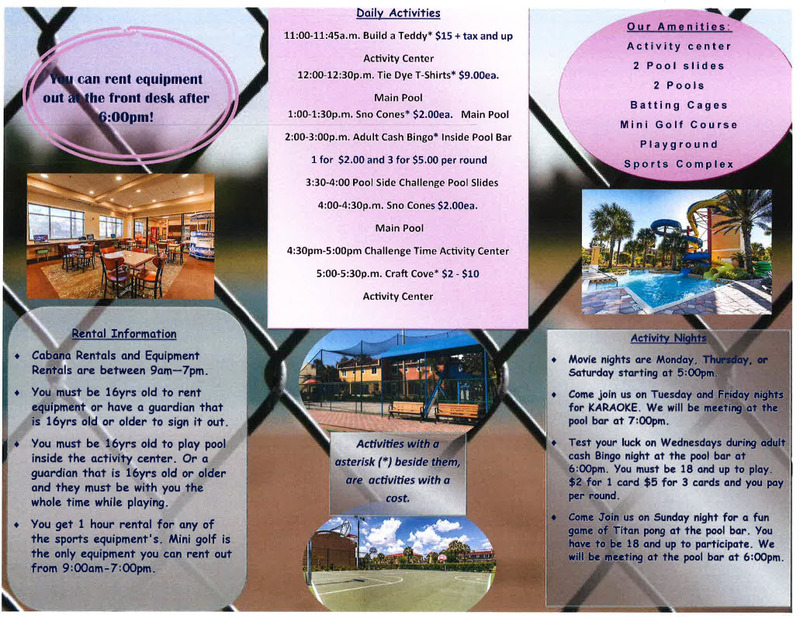 In addition to our normal weekly activities, Fantasy World Resort, one of the top resorts in Kissimmee FL, treats its vacationers to some extra fun throught the year! Contact us for more details on holiday related events happening at Fantasy World.